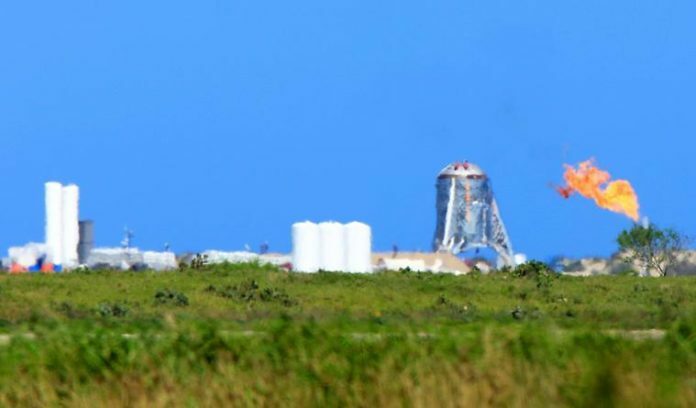 BROWNSVILLE — As SpaceX’s first short static fire test of the Starship Hopper’s Raptor rocket engine was achieved briefly but dramatically after sunset on April 3, the company is in the process of expanding its space-vehicle production team at Boca Chica. SpaceX’s intention to move fast is clear by the wording of its job posting for Build Engineers “to rapidly build early versions of the Starship and Super Heavy (rocket booster) vehicles,” the final versions of which will one day get humans to Mars, according to the company’s plans. “Build Engineers will spend time both in the office and on-site (local production floor and remote build sites) to execute on the mission to build an orbital-capable Starship and Super Heavy faster than anyone thought possible,” reads the listing. The first non-orbital Starship prototype — now dubbed “Starhopper” by SpaceX CEO and lead designer Elon Musk — lit up the launch pad at Boca Chica Wednesday night. The company is also accepting applications for Vehicle Integration Engineer and Vehicle Integration Technician for the Starship project. The vehicle integration engineer “interacts with almost every part and system on the vehicle” and is mainly responsible for building, installing and testing components and system-level hardware, according to SpaceX. “Vehicle integration engineers work hand-in-hand with technicians and other groups to bring the vehicle from just a primary structure to fully functioning spaceflight-worthy vehicle,” reads the posting. The Vehicle Integration Technician, meanwhile, is responsible for “integration of all secondary structure, avionics (electronic systems) and stage-propulsion components and systems to the vehicle’s primary structure,” according to the company. Musk said via Twitter on March 17 that SpaceX was seeking regulatory approval for Boca Chica and Cape Kennedy, Florida, to launch the first Starship orbital flights. An orbital Starship prototype is under construction at the company’s Boca Chica yard, roughly 1.5 miles west of the launch site. SpaceX has also been advertising for Tank Fabricators/Welders and Tank Fabrication Supervisor at Boca Chica for several weeks. On Thursday afternoon, Cameron County Judge Eddie Trevino Jr. ordered the closure of S.H. 4 and Boca Chica Beach between 2 p.m. and 10 p.m. on April 5 for SpaceX testing. A further closure date of April 6, between 1 p.m. and 7 p.m., was also authorized in the event testing does not take place or is not completed on April 5. S.H. 4 will be closed temporarily from Oklahoma Avenue to the beach entrance.